The Yangtze is Asia’s longest river and drains one-fifth of China’s land area. Revered as the “mother river,” it has nurtured China’s history, culture, and economy since the dawn of civilization. This relationship between the people and the river has, in recent years, grown tense. Despite unprecedented advancements in engineering, all major cities on the Yangtze increasingly suffer from mounting flooding damage—demonstrating that the river is far from tamable. 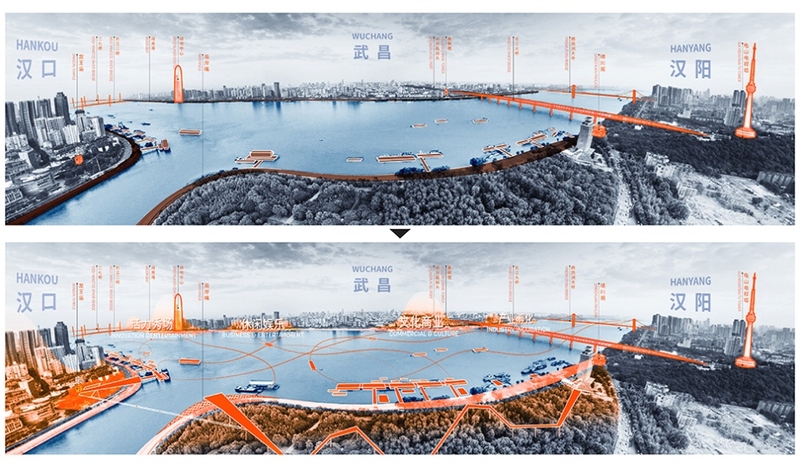 Emerging because of its relationship with the Yangtze, central China’s largest city of Wuhan has coevolved with the river so symbiotically for the past 1,800 years that every milestone in its history has been tied to the river. Centuries of floods created fertile land for the early settlers, and high water safeguarded the birth of the city. 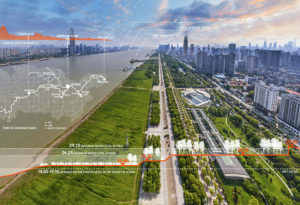 As Wuhan has emerged as one of China’s hotbeds for technology, education, and innovation, land prices have soared and the city faces rising conflicts between development pressures and public demand for open space. 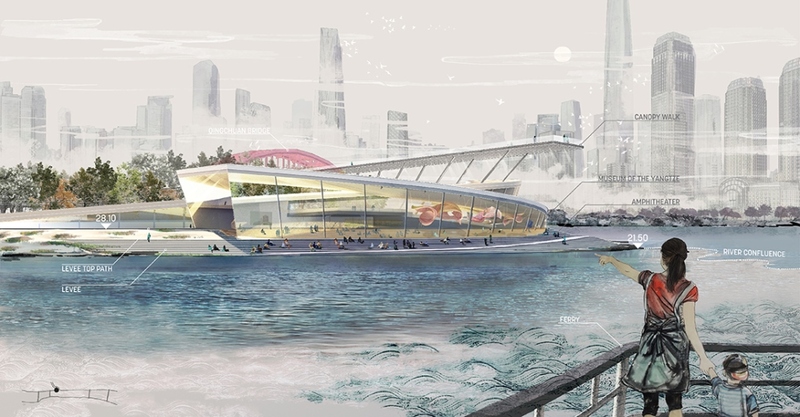 It is striving to explore new ways of embracing the river after nearly a century of industrial exploitations and urban expansion. 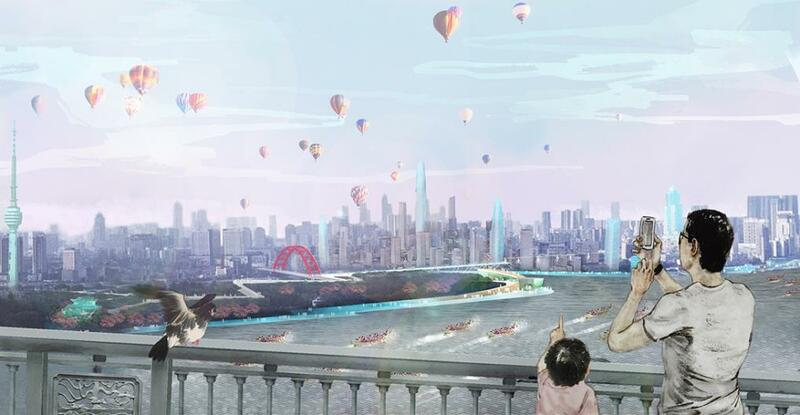 Now, the Boston-based architects at Sasaki have released the details of their redevelopment proposal for the Yangtze Riverfront Park in Wuhan. Developed in collaboration with OMA and Gensler, Sasaki is drawing on that centuries-old symbiosis between the city and river. Rather than fighting it, they are leveraging the river’s natural flooding dynamic to nurture a rich regional ecology. 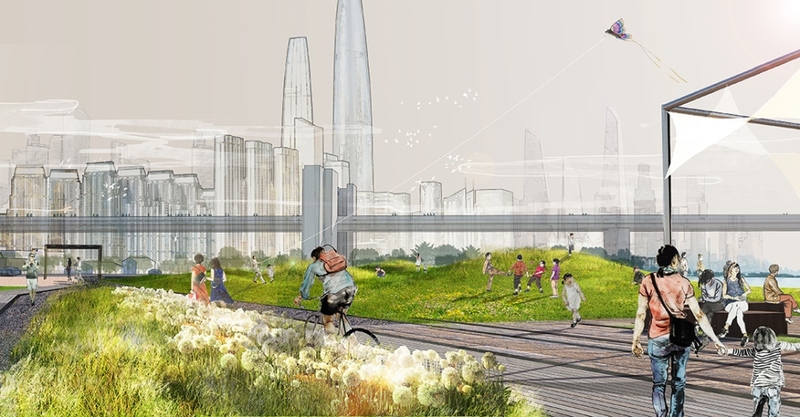 In so doing, they also intend to revitalize the urban setting via enhanced recreational experiences. This “river culture” is so deeply embedded in Wuhan that today people still frequent the riverfront parks even when they are flooded—enjoying the rare excitement of such intimate contact with the water. 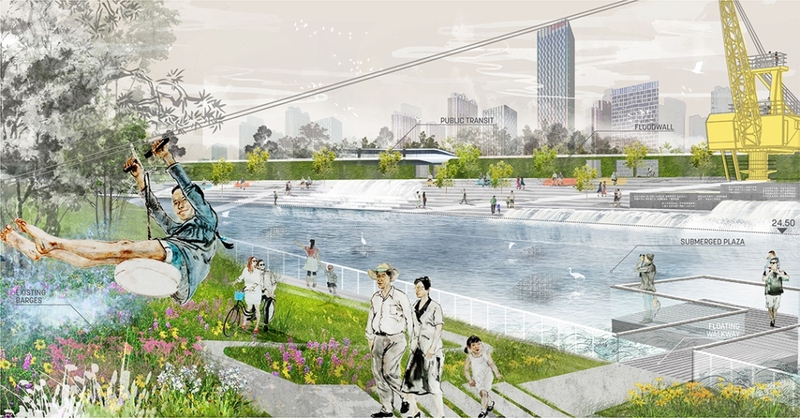 The design of the park celebrates this strong river culture and leverages frequent flooding events as a vital driver of placemaking strategies. Much of the programming along the river is designed to celebrate the river’s spontaneity and incorporate its flooding as an essential element of the ever-changing landscape. The river’s mudflats continue to play a critical role in supporting biodiversity and delivering crucial ecosystem services, but the sediment flux of the Yangtze River has dropped tremendously due to numerous upstream hydrological projects along the river. The rapid disappearance of these mudflats places regional biodiversity in jeopardy. 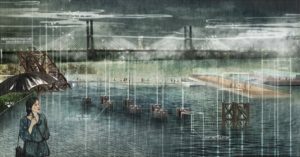 Through strategic dredging and grading, the design creates heterogeneous microenvironments that host a wide variety of distinct wetland ecosystems in the mudflats. Nuanced topography, coupled with the river’s frequent water level fluctuations, enable complex plant communities to grow. From emergent marshlands to vernal pools, these typologies create an evolving landscape character throughout the year. Alongside logs for turtles to loaf on and submerged fish structures, waterfowl nesting platforms are installed in the open marsh. Discreet birding stations within the tree groves offer viewing opportunities for wildlife enthusiasts. Recreational spaces are arranged based on careful calculations of the dispersing distances for the key wildlife species in the river basin such that they do not intrude into the primary habitats. During floods, the recreational fields in the mudflats are temporarily returned to the river and repopulated by fish and waterfowl. Wuhan’s rich industrial history is also celebrated, with historical landmarks highlighted throughout in the riverfront park. Though largely abandoned, the site’s massive railyards and remnants of freight train ferry terminals have a strong visual presence. This heavy-duty infrastructure offers engaging platforms for park visitors to more intimately experience the river, while a series of barges are connected to form a floating promenade. This promenade rises and falls with the river, and delineates a uniquely dynamic space in between. 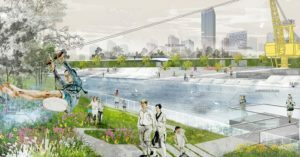 The design of the riverfront park repurposes these industrial relics as vibrant waterfront hubs of new cultural and recreational uses, including floating plazas, restaurants, galleries, and even a floating community garden. 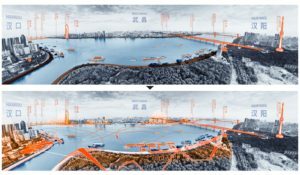 A web-based outreach effort generated fruitful public support of the design, and consensus on the future of Wuhan’s waterfront. Throughout the design process, over 65,000 public comments were collected, helping to inform design various iterations. Local civic groups also organized a series of public meetings and site tours to promote stewardship of the river’s public landscapes. Local youth were also invited to portray their vision for the waterfront park at an event on site. Built upon a strong consensus from the public engagement, the master plan for revitalizing the Wuhan Yangtze Riverfront Park creates a socially inclusive and ecologically meaningful waterfront with a strong cultural identity that embraces the Wuhan’s unique philosophy derived from centuries of living alongside a dynamic river. All images courtesy of Sasaki.